A hand jogger for all types of Paper Cutters & Guillotines. Ideally suited to assist the levelling and moving of the paper pile / stack on the cutting table. Pole handle in a 90 degrees angle for good grip. European shaped handle for comfortable use. 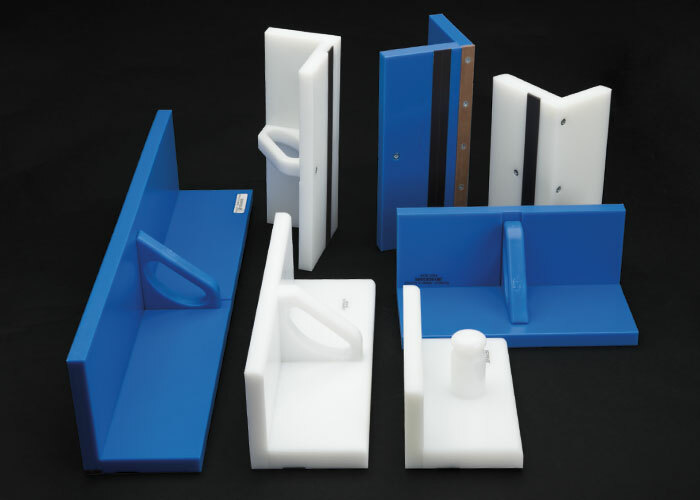 Plastic Jogger Blocks are made from strong HDPE plastic material in blue and white colour. The magnetic strip inserted on the base ensures good contact with the cutting table and that all sheets are jogged without slippage and the HDPE lubricated material allows easy slide. Available in a range of sizes from 75 to 150mm (3” – 6”) height and from 200 to 650mm (8” – 26”) length. Custom sizes, materials and colours can be made upon request.